The Secretary In-charge of Medical Education and Health Department of the States are hereby requested to send their proposal under the EWS scheme in consultation with DMEs and concerned institutions u/s 10A of the IMC Act, 1956 for the academic year 2020-21. Efforts may also be made to put in place additional facilities ie. teaching, training, beds and faculty, etc. required for the same. You are further requested to furnish the programme-wise seat increase matrix along with course-wise information as per the enclosed format. Medical Dialogues had reported that earlier this year, on January 9, the Parliament had passed the Constitution (124th Amendment) Bill 2019 to help the Economically Weaker Sections (EWS) of Indian society. The bill focused on providing 10 per cent reservation in jobs and higher education to the general category poor. 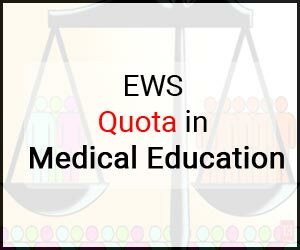 Considering the bill, it was decided that all educational institutions including ones in the medical field, will offer the EWS quota in the General Category. To facilitate the decision, the MCI has now issued a circular to respective medical education departments, medical universities of the states running GMCs under its jurisdiction; directing them to furnish necessary information in the given format so that the EWS quota can be implemented at these concerned institutes. The format mandated to be filled by medical education departments’ authorities entails the information regarding medical college wise name of programme courses (PG Medical), their existing capacity both permitted and recognized and the number of seats to be increased in 2020-21 to implement to 10% reservation. The format which is required to be filled by medical institutions includes the proposed number of seats for 10 EWS quota that could be accordingly increased by MCI, the name of the PG medical courses, their existing intake of PG medical students and number of recognized and permitted seats. In addition, the MCI has demanded the details of the MBBS seats at these GMCs, infrastructural and teaching facilities and clinical material as well as radiological investigation details. Sir why the reservation exists for only backward caste ?Also there are some students in general category who are economically poor ..This is not fair .so reservation have to implemented based on economical status not on the basis of caste system.There are many students from backward caste who are economically very sound they can join in management quota by paying more than 2 crores,at the same time there are students from open category who can\’t afford even b cat seats ..Is this the justice provided my government of India to a open category student who are economically poor.At least u guys open ur eyes now and show some concern towards us.Is it a sin to born in economically poor upper caste.At least recognise us now provide justice to us. Good move. There is nothing wrong in this. Students selected in this will be good students. Still u don\’t know how to judge a person..still u r having caste feelings…people like u are making this country worst…. There should not be any kind of reservation in PG. Once underprivileged student has got admission during graduation then all are equally capable. If government is not capable of upbringing them after so many years after independence then government is at fault not the non reservation students. What d hell… Nasty politics.. doing whatever they want..never ask about public or doctors community opinion… Just want votes.. MCI is always tainted….